comment Minimum hassle on arrival with our instant gate ready ticket. Enjoy fast track entry to Loro Parque as you bypass the long ticket and voucher lines! Instant gate-ready ticket - bypass the ticket and voucher lines with direct entry to Loro Parque! Discover the Antarctic and feel the polar climate in the world’s biggest Penguin habitat. Real snow, a huge iceberg and hundreds of Antarctic penguins await you in their impressive ice-covered world. Planet Penguin has a near 360-degree viewing platform which is considered by many the best human recreation of Penguin natural habitat. Get face to face with the magical creatures that inhabit the oceans and rivers at Loro Parque’s Aquarium. Immerse yourself in this watery world that is home to thousands of different species of fish and corals. 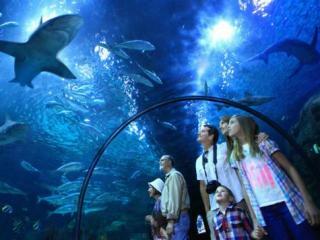 Beyond the Aquarium is the awe-inspiring Shark Tunnel that gets you alongside, underneath and face-to-face with some of the ocean’s most impressive predators. Explore Katandra Treetops a unique environment of jungle paths and hanging bridges, you’ll love searching high and low for all the different species of birds you will see there from the loris, cockatoos, kookaburras and emus in this amazing jungle setting. No great animal park adventure would be complete without paying a visit to magnificent all male gorilla family at Loro Parque Tenerife. The expansive viewing panes let you get so close to their natural forest environment that you’ll feel you can almost touch the grass - with a view like this it’s hard to tear yourself away from these guys. Wander through our lush tropical landscape and uncover animals and birds from every corner of the world. Take your seat at the spectacular Orca Ocean and watch as the killer whales demonstrate their strength and agility and see if you can keep a grin off your face as our acrobatic dolphins show you their gravity defying moves. Loro Parque is located in the North of Tenerife close to Puerto de la Cruz, around an hour by car from the popular resorts in the south of Tenerife. If you do not have a car, a ticket for the coach service between the Southern resorts and Loro Parque can be easily purchased locally. Loro Park opens at 8.30am and closes at 6.45pm. Last entrance is at 4.00pm. Opening Tmes are subject to change. Loro Parque One Day Ticket includes a full day entry into Loro Parque. You will receive a gate-ready Loro Parque ticket, not a voucher, ensuring minimum fuss when you arrive at Loro Parque. There is nothing to redeem and you simply go straight through the gate on arrival. Your gate-ready Loro Parque Tickets will be available to download instantly after full payment has been made. Loro Parque Tickets are open-dated and activated the first time they are used. Your ticket is valid for the year of purchase. Tickets do not include transportation to Loro Parque. In Puerto de la Cruz the Loro Parque Express picks people up free of charge from the “Plaza Reyes Catolicos” every 20 minutes from 9.00 onwards. Last departure from the park leaves at 18.45. From other resort areas, take the motorway north and follow the signs to Loro Parque and Puerto de la Cruz. The Loro Parque Ticket price does not include car parking which is approximately €2.40 per day at Loro Parque with 200 parking spaces. (Prices are subject to change). How do I get my Loro Parque Ticket? Your Loro Parque Tickets will be instantly available to download after full payment has been made. Since these are barcoded tickets, there is nothing to redeem locally and you simply go straight through the gate on arrival. Do I have to select a date to visit Loro Parque? No, Attraction Tickets Direct will send you open-dated Loro Parque Tickets. These tickets can be used at any time.